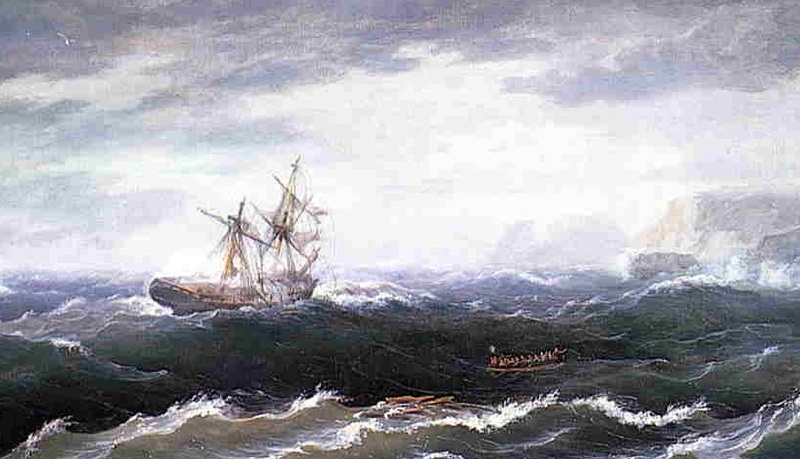 Detail from Ship at Sea (also known as Shipwreck), 1833, by American marine painter Thomas Birch (1779–1851), who is especially well known for his paintings of naval battles from the War of 1812. Image courtesy of The Athenaeum.
. . . I have made great progress in a new book, of entirely new character. It will be called ‘Ned Myers; or the life of a tar.’ This is real biography, intended to represent the experience, wrecks, battles, escapes, and career of a seaman who has been in all sorts of vessels, from a man of war to a smuggler of opium in China. The facts are these. Near forty years ago I went to sea before the mast, to fit myself for the navy. Last winter I got a letter [from Ned], who, then a lad, had been my ship mate in a long trading voyage. . . .
Ned Myers (born Edward Robert Meyers) was a thirteen-year-old apprentice aboard the American merchant ship Stirling when the sixteen-year-old Cooper signed up in 1806 for a yearlong voyage to England and Spain. The two became good friends during the voyage but afterward lost touch as each followed his own career—Myers almost entirely at sea and Cooper mostly on land. On January 23, 1843, Myers wrote to the famous writer, asking if Cooper were the sailor he knew from the Stirling. “I am your old shipmate, Ned,” the novelist responded. When the book was finished, Cooper found his friend a job at the Brooklyn navy yard—the same location where, thirty years earlier, Myers had enlisted in the Navy at the outbreak of the War of 1812. He volunteered to serve under Commodore Isaac Chauncey on the USS Scourge in Lake Ontario, one of fifteen ships forming the Great Lakes Squadron. The Scourge had been built as a merchant schooner, confiscated by the U.S. Navy for the war effort, and hastily converted to a makeshift military vessel. 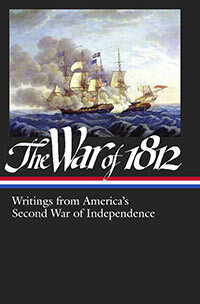 Two hundred years ago, on August 8, the Scourge and another ship, the Hamilton, unexpectedly encountered a summer squall while patrolling the lake, and the following selection describes the sailors’ terrifying and tragic night. In 1973 Daniel Nelson, a Canadian dentist, used sonar to locate the remains of both ships, resting three hundred feet below the lake’s surface. A decade later, a team of scientists sponsored by the National Geographic Society used underwater equipment to photograph the wreckage of both ships, which were found to be in remarkably well-preserved condition. There is a postscript to the biographical account in Cooper’s book: After the publication of Ned Myers, Cooper gave his friend part of the proceeds, and the book’s eponymous hero flourished for a few years. He settled down and married a widow with children (one of whom was hired by the Coopers as a domestic servant), and at least one additional child was born to the couple. Unfortunately, Ned’s new life didn’t last; he died in 1849 after a bout of heavy drinking. Cooper continued to look after the Myers family after Ned’s death and added a provision in his own will for their care. Notes: The above excerpt from the letter and some of the biographical data about Ned Myers are from The Letters and Journals of James Fenimore Cooper: Volume IV (1840–1844), edited by James Franklin Beard and published in 1964. On page 290 of the selection, the term Davy is a reference to Davy Jones, the legendary devil-ghost of the sea. I was soon asleep, as sound as if lying in the bed of a king. How long my nap lasted, or what took place in the interval, I cannot say. I awoke, however, in consequence of large drops of rain falling on my face. . . . If you don't see the full selection below, click here (PDF) or click here (Google Docs) to read it—free!